Live Mesh is an amazing platform. There are so many things which you could do with it. Imagine a scenario where you are in your office in some remote location. You make some updates to your calendar events or add some new appointments. You also make changes to your Emails, and add another contact name. Now you go back home and have all the changes which you made in your office reflected back to your home PC. Wouldn’t that be great? Now lets see how are we going to achieve all this. The procedure below uses Microsoft Outlook in Windows Vista as the example device. If you are using Windows Live Mail, Windows Calendar and Windows Contacts for your emails, appointments and contacts, then check out the Note mentioned at the bottom of this article. 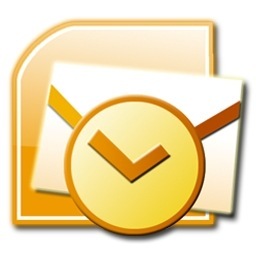 Microsoft Outlook stores all the users data(Emails, Calendar, Contacts & Tasks) in a outlook compatible .pst file. This .pst file is stored at C:\Users\[Username]\AppData\Local\Microsoft\Outlook\ location. Step 1: On your deviceA, navigate to this location: C:\Users\[Username]\AppData\Local\Microsoft. Here right click on Outlook folder and click on “Add folder to your Live Mesh”. 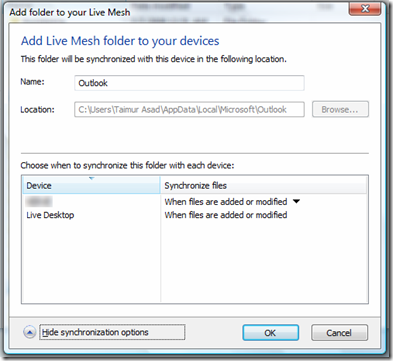 Step 2: In synchronization settings, select the devices to which you want your Outlook Calendar, Emails etc to synchronize with. Your deviceA is now set up to sync all your Calendar appointments, contacts, email etc. It will take a while(depending on your Internet connection) for deviceA to upload all your data to Live Desktop. 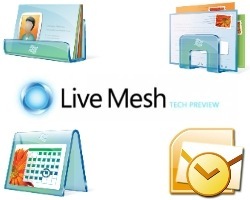 Step 3: Now on deviceB, go to C:\Users\[Username]\Live Mesh Folders\. Here you will see a blue colored(faded) shortcut for your Outlook folder. Double click on it and set this location C:\Users\[Username]\AppData\Local\Microsoft\Outlook\ of your Outlook folder on the deviceB to synchronize with all the Calendar events, contacts, emails and tasks of Outlook from your deviceA and Cloud(Live Desktop). That’s it. You have successfully synchronized your calendar, emails, tasks and contacts of Outlook from deviceA to the Cloud(Live Desktop) to deviceB. Step 4: Similarly, you can repeat step 3 to synchronize the same Calendar events, contacts, emails and tasks of Outlook with any other device. NOTE: If you want to add contacts from Windows Contacts, calendar appointments from Windows Calendar and Emails from Windows Live Mail then just add the following folders to your Mesh and then simply follow Step 2 to Step 4 to synchronize these with all your other devices. Check out our Live Mesh Scenarios Directory for more tutorials. UPDATE: As Aaron rightly pointed out. Unfortunately Live Mesh blocks .pst file from synching across multiple devices. There is a workaround for it but it isn’t all that perfect. 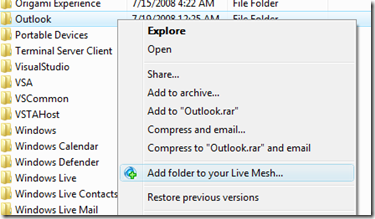 You can trick Live Mesh to sync your Outlook data file by renaming the .pst to .pstx(or any other. You must backup your existing file before changing the extension) file. Live Mesh will upload the file to the cloud and then it syncs back .pstx file across all those devices which you have selected it to sync with. After the file has been uploaded, you will have to go to your Live Desktop and then rename .pstx file back to .pst. At this point you will notice that this change happens on all the devices and Outlook on all devices now reads all the data from the new .pst file. But since .pst file is not supported by Live Mesh, it will delete the .pst file from cloud only as soon as you change the extension to .pst from .pstx. So you will have to repeat this procedure every time you make a change to your Outlook’s data which probably isn’t all worth it. I don’t exactly get why .pst file is not supported. Hopefully the future versions of Live Mesh will support it. That said, the above tutorial has no such issues if you use Windows Contacts, Windows Live Mail and Windows Calendar for your contacts, emails and calendar appointments. I might be wrong here, but this seems to be a very dangerous scenario that is being suggested. If one device makes a change to the pst file before another can finish sychronizing, then there will be a synchronization conflict that can only be resolved by overwriting the changes on one of the devices. If these changes are significant, the issue could lead to lost emails and contacts, undelivered emails or worse. In other words, you could very likely see disappearing content left and right if you made changes on more than one device. In order for this to work, Mesh would have to understand the changes to the file and do a smart merge of changes. To my knowledge, this is not a feature that will be shortcoming in the Live Mesh product. The other alternative would be for the email client to store each item as a separate file. If all items (emails, contacts, appts, etc) were stored as separate files, the time-stamp on each file would make it very clear how to resolve conflicts. The same issue applies to all types of database files, and so I would caution against using Mesh with Access databases or other database-type files. In summary, I would strongly advise against this email synchronization scenario. If someone can confirm or disconfirm my logic here, please post and let us know. In comment to my comment above, note that even if there is only one PC makes “changes” to the PST file, the issue does not go away. Keep in mind that Outlook modifies your mailbox (“.pst”) files all the time without asking you. Every time you open or close Outlook, the pst file is modified, even if you don’t make changes. You can confirm this yourself by opening and closing outlook while monitoring the “Date Modified” in Windows Explorer. Once again, please correct me if this is concern is misdirected. I apologize for three comments in a row, but this one is definitive. Check the following link for the official say from Microsoft. “Are there types of files or folders that I cannot share or synchronize? Thanks for pointing out about the .pst file being not supported by Live Mesh. I have added an UPDATE note to the above post. Do read it. I heard about not bad application-read contacts from pst, provides a possibility to read contacts from pst, decrypt this file and extract all contacts to *.vcf files, that can be opened by Personal Information Management (PIM) and Windows Address Book any time. Other files are extracted with *.eml and *.txt extensions. In away the lack of support for .PST is a good thing 😕 . I didn’t really fancy placing my company .PST file onto the web for all the obvious reasons. I think it would be better if we could automatically copy new/amended: contacts (vcards) , calendar items (iCalender), and tasks (.txt, or .task or whatever) to Live mesh (or perhaps a USB drive) but only if they have certain categories e.g. “@home”. 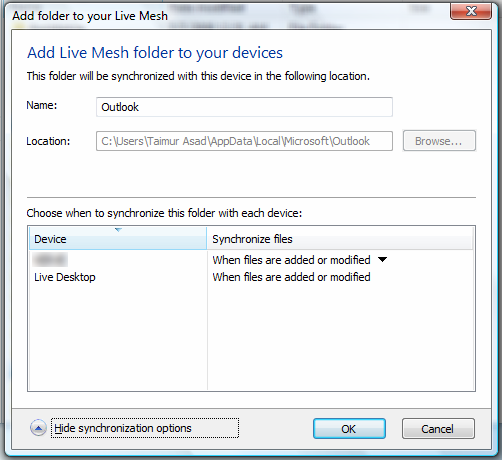 The other devices could have reciprocal arrangements whereby via live mesh they see that there are these new items ready to be moved into Outlook; in the appropriate folders and they simply perform the sync. Therefore, is this available or will one of the developer community have to build this for Live Mesh? PS: before someone pipes up and shouts: “Use a Blackberry”! Well, I neither own or want one…..